Domino’s was heavily reliant on a legacy service desk tool. When Karen Copley was hired to oversee all aspects of service delivery for the organisation, she immediately recognised that this tool needed to be replaced. According to Karen, it offered no way to obtain management information. There was also limited automation capabilities. 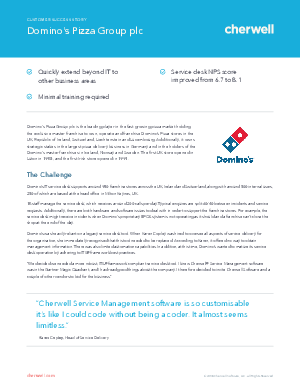 In addition, at this time, Domino’s wanted to mature its service desk operation by adhering to ITIL® framework best practices.